To provide a platform to the students to exhibit their talent of singing with actions is the purpose of the competition. They provide an opportunity to develop social, communication and language skills. Students of class I participated in the Action Song Competitions that was held in three languages namely – Hindi, English, and Malayalam on 13th & 14th January 2019. Based on the results of the preliminary rounds, the final round of Action Song competition was held for the shortlisted students. Three students were judged as winners under each category of the Action Song competition. The Spell Bee Competition was conducted on 8th January 2019 for the students of classes I to V. This competition helped the students to learn the spellings well and be thorough. Also, students were encouraged to develop their spelling skills, form new words, develop critical thinking. Such activities surely help to inculcate and enhance the reading habits in students and enrich their vocabulary and language skills. The top three scorers from all grades were awarded with a special gift and a certificate during the Primary Section Assembly. A special assembly was conducted by Primary Section students as a part of Christmas Celebration on 12th December 2018. The students displayed the joy and enthusiasm welcoming the festive season of Christmas with tapping their feet to the tunes of Jingle Bells. Picnics and outings are recreational activities which rejuvenate children after continuous studies. To give them a break from the monotony of work, Picnics were held for the classes I to V at Saqr Park from 9th December to 12th December 2018. The students of different classes were taken on different days. They were escorted by their class teachers. There they had fun-filled day full of fun activities. Refreshments, swings and rides filled the children with renewed vigour. They had gala time in the lush green grass of the park. 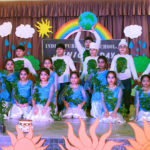 The campus of IPHS glittered with jubilation and delight on 28th November 2018 as it was the occasion of Juniors’ Day Celebration. The chief guest of the function was Dr. K.R. Sheeba, Lecturer, OB/GYN, RAKMHSU. The Chairman Mr. Reji Skariah, the Principal, Mrs. Anubha Nijhawan, Vice Principal, Dr. Annamma Mathew, Supervisors were present. The programme commenced at 5 p.m with the recital of Holy Quran followed by the UAE and India’s National Anthem. Primary section Annual Report was read by the supervisor Mrs. Shammy Santhosh. The annual report encapsulated the achievements and accomplishments of the students as well as school for the year 2018- 19. Proficiency certificates were awarded to those excelling in academics. The cultural extravaganza showcased the talent of juniors. It started with the scintillating welcome dance followed by a variety of performances. The students enthralled the audience with their mesmerizing performance. The vibrant songs, colourful costumes and synchronization filled the air with liveliness. The programme culminated with a happy note. The students of Classes II and III were taken to Desert Oasis Nursery, RAK on 15th and 16th October 2018. The objective of the trip was to make the students aware of the different types of plants like herbs, shrubs, climbers, creepers. It was a good opportunity to gather knowledge pertaining to their sustainability and understand the native plants and their characteristics features. The students enjoyed a lot and the trip was informative and interesting. The aim of conducting Story Narration Competition is to give an opportunity to students to exhibit their narrative skills. Competition in Story Narration gives students an opportunity to showcase their inherent narrative skills. Students of class II activity took part in Story Narration Competitions held in Hindi, English and Malayalam languages on 14th and 15th October 2018. It was fascinating to watch children narrate stories with actions, voice modulations and using props. The competitions were conducted in 2 rounds and the winners of final rounds of competition will be awarded with certificates. Primary Section students of IPHS have done various activities on the day of Gandhi Jayanti to respect Mahatma Gandhi, the Father of Nation. Light Music Competition for Malayalam language was conducted on 10th September 2018. Music helps students to learn different traits like – coordinating with one’s own self as well as others, enhancing the imaginative horizon and intellectual curiosity and boosting self-confidence. Activities like these helps children in overall develop. Children participated enthusiastically in Monoact Competition which was conducted on 12th September 2018. It builds confidence and effective communicative skills. Students participated in their best way. Judges for the events – Light Music Malayalam: Mrs. Manjusha, Mr. Murali. Mono Act : Mrs. Vrinda, Mrs. Aleyamma. On 24th April 2018 students of Class V visited the International Book Fair, Sharjah along with two teachers Mrs. Vrinda V and Mrs. Nandini Bakshi. There were a huge number of books on various subjects and languages by different publishers at their respective stalls. Students were amused at seeing many different kind of stalls. Students purchased books of their interest. Activities such as Flower Making, Safety of Children, Future Machines, Working of Robot and Live Cooking Shows also captivated the students. Robotics area was a new amusement for the students. They saw Live demo of a working of a Robot. They enjoyed watching a robot making coffee and distributing to the customers. This visit was very useful to the students as they learned new things, saw future machines and learned about their safety. Students were happy with their new books. Overall it was a nice experience to visit International Book Fair. IPHS conducted an Orientation Programme for the parents of students of Class I and newly admitted students of classes I to V on 5th April, 2018 at 5:30 pm in the school premises. The programme began with the introductory talk by Principal Mrs. Anubha Nijhawan. The Principal introduced the class teachers and explained the policies of school regarding academics, attendance, transportation, health and safety of students. Principal encouraged parents to join hands in all the efforts of the school for the all round development of children. Principal’s talk was followed by an awareness talk on the policies and other important norms of CBSE and MOE by the school Social worker and student counselor Mrs. Bitty Devasia. This session was followed by an interactive session between parents and class teachers of Class I in which teachers explained the various points regarding academics and non academics. The meeting adjourned by 8 p.m.